The Tribesmen scored early and late as the Saints crumbled at home. Harry Manning reports from Richmond Park. 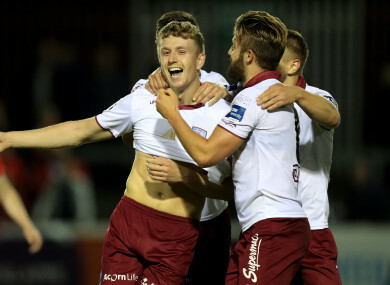 GALWAY UNITED REACHED the quarter-finals of the FAI Cup for the first time since 2010 after they overcame St Patrick’s Athletic 2-0 at Richmond Park. Brighton and Hove Albion loanee Jonah Ayunga blasted Shane Keegan’s men in front after 16 minutes before a scorcher from Eoin McCormack right at the death sealed their progression. After a jittery opening period from both sides, the Tribesmen burst into a life with a brilliantly-worked goal on 16 minutes. Ronan Murray darted down the left channel before driving a low cross into the box. Ayunga drifted in front of his marker before slamming the ball into the net for his first goal in Galway colours. The Saints reacted well and were inches from drawing level, hitting the woodwork on two occasions before the half-hour mark. First, a Conan Byrne corner was met by Ian Bermingham whose clever flick rebounded off the outside of the post. Two minutes later, an audacious 40-yard strike from Jordi Balk had to be pushed onto the post by Conor Winn. J.J Lunney was next to test his luck. In first-half stoppage time, he took the ball into feet from outside the area before curling a brilliant strike towards goal. However, the colossal Winn flew across his net to divert it away from the top corner with a powerful punch. The second-half was a much quieter affair in comparison. St Pat’s dominated large parts of the play, however, they were often left frustrated by the well-drilled Galway defence and didn’t truly test Winn again until the 70th minute. Balik’s stinging drive from distance tested Winn even more after taking a deflection on its way, however, the Englishman was equal to it and made a solid stop. Five minutes from time, the Saints’ fans thought they had found a leveller. Byrne whipped in a wicked cross from the right wing which was met with force by Ian Turner, however the substitute could only turn it into the side-netting from close range. Then, in stoppage time, United wrapped up the victory in stunning fashion. McCormack picked up the ball 30 yards from goal before unleashing a bullet which flew into the top of the net, leaving Barry Murphy stranded and securing the Tribesmen’s place in Monday’s quarter-final draw. Email “Galway into their first FAI Cup quarter-final in seven years after taking Pat's at Inchicore”. Feedback on “Galway into their first FAI Cup quarter-final in seven years after taking Pat's at Inchicore”.